When you’re in the stands at a Pitt football game, there are a handful of cheers you’re bound to hear: “Hail to Pitt,” “P-I-T-T: Let’s Go Pitt,” and the infamous anti-Penn State chant. Regardless of whether or not Penn State is the opponent on the field, that chant will echo throughout the student section. Even though the teams’ first game of the renewed rivalry was only last year, I’ve heard the anti-PSU chant since the first game I attended in my first year at Pitt. While the tweet itself isn’t overwhelmingly exciting or negative, the replies to the tweet are. A majority of the responses say the teams are not rivals, and some stoop to throwing insults about topics which are neither relevant to nor appropriate for this particular game — I’m talking to you, Twitter users mocking serious Penn State scandals. The way the Pitt and Penn State football teams approach the game elicits the responses seen on Twitter and influences how fans look at the game. For Penn State football, this is just another game. Head Coach James Franklin repeatedly pushes this belief. This tactic, though, is nothing new for Franklin. He took the same approach to last year’s game as well. In doing so, he genuinely downplays the upcoming football game. Even though he says each week’s game is a “Super Bowl” for his team, he manages to minimize the connotation of that phrase. For football fans, the Super Bowl is a big deal because it’s the end result of a full season of play. It’s what people expect after dedicating months to watching game after game after game. If Franklin wants to continue using the analogy, the effect is going to wear off. Eventually fans and even opponents will wonder when the Nittany Lions are going to play a team worth being treated as something different. For now, PSU fans look at the game against Pitt as nothing out of the ordinary. Pitt is just another football team, from another school, meant to be trash-talked and defeated. Even though some Penn State fans might not be open to admitting it, something sets the Pitt-Penn State game apart from others: both schools are in Pennsylvania and both compete at the ACC level. So, maybe Pitt doesn’t stand a chance against the No. 4 Nittany Lions, but there is something to be said about this game’s importance to Pennsylvania college football fans — a specific, yet dedicated group. Seemingly taking advantage of this dedication, Pitt Head Coach Pat Narduzzi’s approach to the competition against Penn State is the polar opposite of Franklin’s. 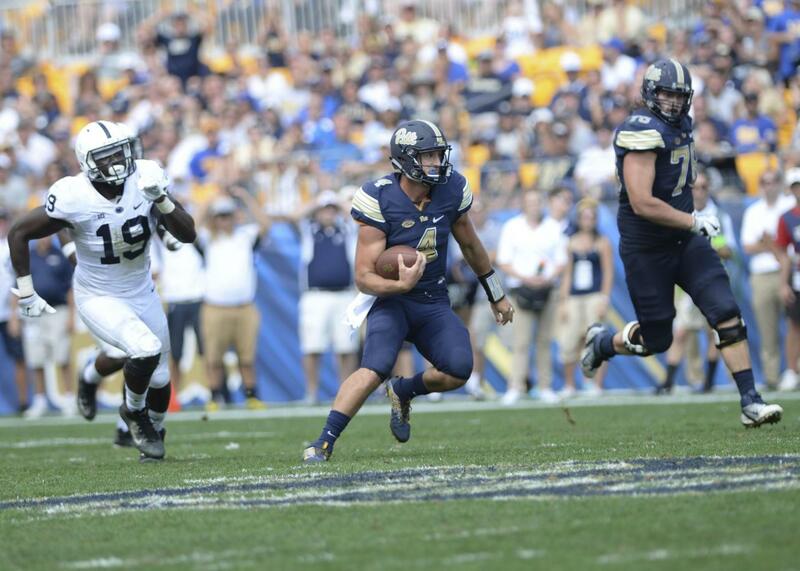 Narduzzi views the game as something to be played up. This could be why he’s sticking with an overdramatic tactic: a media blackout. In the week leading up to the game, Pitt’s head coach decided to keep everyone except himself away from the media. His reason for doing so is to keep his players focused on their goal — preparing to beat the Nittany Lions. Narduzzi took the same approach last year, and while the Panthers scraped by with a 42-39 win, can a media blackout truly be credited for that success? I don’t think so. There are too many other factors in the equation. Unless Narduzzi is also strictly prohibiting his players from using social media, reading newspapers or talking to anyone, there are still chances for distraction. Maybe it’s the two teams’ disagreement about the weight of the game that continues to fuel animosity between Pitt and Penn State fans. While Penn State fans follow Franklin’s lead and insist the game is just like every other game, Pitt fans approach the game as if it’s the biggest of the season. The most interesting outcome of this game will be how the tone shifts depending on which team wins. If Pitt wins again, will the Lions finally think of the Panthers as their rival? And if Penn State wins, will that end the debate? Whichever way the game ends, one thing is for sure: the animosity will not, and Pitt fans will continue chanting against the Nittany Lions even when they’re not on the field.